The exact cause of sarcoidosis is unknown. What is known is that when a person has the disease, tiny clumps of abnormal tissue (granulomas) form in certain organs of the body. Granulomas are clusters of immune cells. The disease can affect almost any organ. It most commonly affects the lungs. Doctors think that having certain genes makes it more likely for a person to develop sarcoidosis. Things that may trigger the disease include infections with bacteria or viruses. Contact with dust or chemicals may also be triggers. The disease is more common in African Americans and white people of Scandinavian heritage. More women than men have the disease. The disease often begins between ages 20 and 40. Sarcoidosis is rare in young children. A person with a close blood relative who has sarcoidosis is nearly 5 times as likely to develop the condition. There may be no symptoms. When symptoms do occur, they can involve almost any body part or organ system. To diagnose this condition, a biopsy is needed. 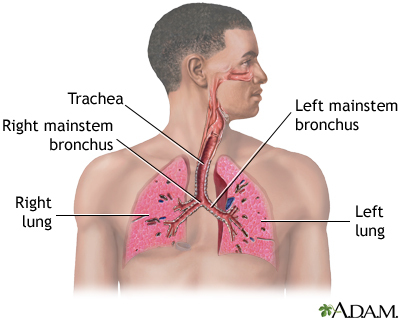 Biopsy of the lung using bronchoscopy is usually done. Biopsies of other body tissues may also be done. The ACE test measures the level of angiotensin-converting enzyme (ACE) in the blood. Sarcoidosis symptoms will often get better without treatment. If the eyes, heart, nervous system, or lungs are affected, corticosteroids are usually prescribed. This medicine may need to be taken for 1 to 2 years. Medicines that suppress the immune system are sometimes also needed. In rare cases, people with very severe heart or lung damage (end-stage disease) may need an organ transplant. Many people with sarcoidosis are not seriously ill, and get better without treatment. Up to half of all people with the disease get better in 3 years without treatment. People whose lungs are affected may develop lung damage. Judson MA, Morgenthau AS, Baughman RP. 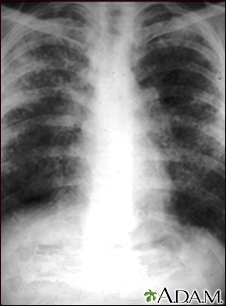 Sarcoidosis. In: Broaddus VC, Mason RJ, Ernst JD, et al, eds. Murray and Nadel's Textbook of Respiratory Medicine. 6th ed. Philadelphia, PA: Elsevier Saunders; 2016:chap 66. Soto-Gomez N, Peters JI, Nambiar AM. Diagnosis and management of sarcoidosis. Am Fam Physician. 2016;93(10):840-848. PMID: 27175719 www.ncbi.nlm.nih.gov/pubmed/27175719. 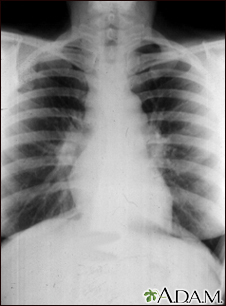 Sarcoid is primarily a lung (pulmonary) disease. In the early stages, a chest film may show enlargement of lymph nodes in the center of the chest near the heart (mediastinum). Sarcoid causes damage to the lung tissue that heals by scarring. 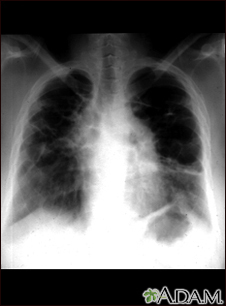 The film shows a diffuse milky and granular appearance in the normally dark lung areas. This individual has marked decrease in lung function. Sarcoid - close-up of the skin lesions. 20 to 25 percent of individuals with sarcoidosis have skin manifestations as seen in this picture. 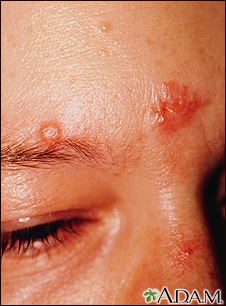 The extent of the skin manifestations is difficult to predict, but the most common are red papules that are translucent as seen here. This picture shows reddish-purple, hard (indurated), painful nodules (erythema nodosum) that occur most commonly on the shins. These lesions may be anywhere on the body and may be associated with tuberculosis (TB), sarcoidosis, coccidioidomycosis, systemic lupus erythematosis (SLE), fungal infections, or in response to medications. 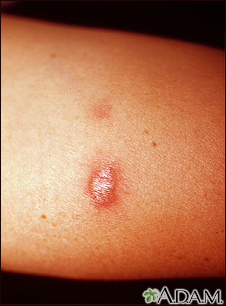 Typical sarcoid lesions consist of red, raised lesions (papules) and patches (plaques) with minimal surrounding skin change. 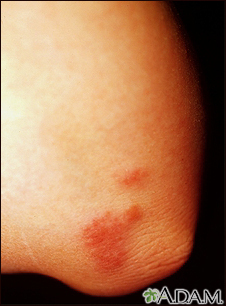 These lesions of sarcoidosis are located on the elbow and are red, elevated patches (plaques). The cause of sarcoidosis remains unknown.